The City of Royal Oak requires no introduction to the Detroit metropolitan area. Conveniently located near several major thoroughfares, Royal Oak’s location is prime. This is evident in the steady rise of property values throughout the city. Royal Oak has maintained the appeal of a small town, while affording many of the amenities of a large metropolis. Because of its respect for diversity, the city’s composition is truly eclectic. The population represents a diverse mix of individuals, age groups, incomes, and myriad of residential home styles. Combined efforts of a proactive city government and Downtown Development Authority over the past several years have brought about a metamorphosis of the city’s central business district. Downtown improvements have included changes to the landscape that encourage socialization. 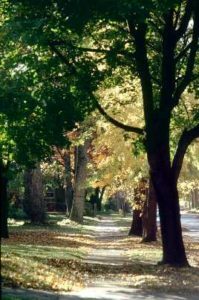 For more than 30 years, Royal Oak has provided a tree planting program for residents. The objective is to replace trees that are lost over time to disease and other factors. The program allows residents to purchase a variety of trees from the city’s Department of Public Service in the spring at prices lower than area nurseries.